Thanks to American Adventurist, I have now been fortunate enough to attend my third Overland Expo East event. Surprisingly, each one just happened to be the first at each location: the Taylor Ranch, the Biltmore Estate, and now the Reeb Ranch. 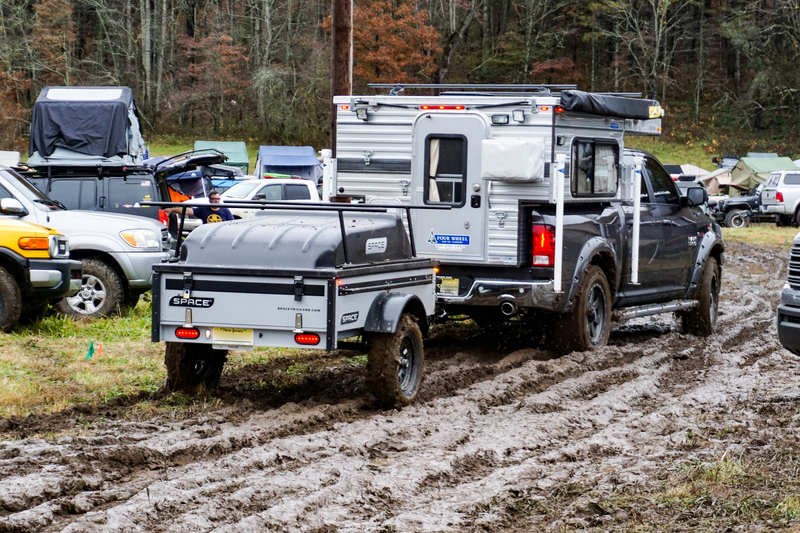 This event has grown beyond belief, I can remember the first Expo East with maybe 20 vendors at Taylor Ranch… fast forward to 2018 with over 154 vendors and it’s easy to see that Overland Expo has already outgrown this beautiful new venue, tucked away within the Blue Ridge Mountains south of Asheville, North Carolina. If the 2018 event had a theme, it would have been “improvise, adapt and overcome” due to Mother Nature making sure that this would be one of the more memorable Expos on record. Benjamin Franklin said it best – “By failing to prepare, you are preparing to fail”. Those who failed to watch the weather prior to the event, and plan accordingly, paid the price at Mudderland Expo. When the American Adventurist team rolled into Reeb Ranch on Wednesday, we were greeted with beautiful green pastures and blue skies, which was the calm before the storm. Everyone was soon to be tested with what felt like 30 hours of continuous rain along with freezing temps. Our American Adventurist team is a well equipped group who’ve been in every climate on earth, so a little precipitation and chilly weather wasn’t going to dampen our spirits. 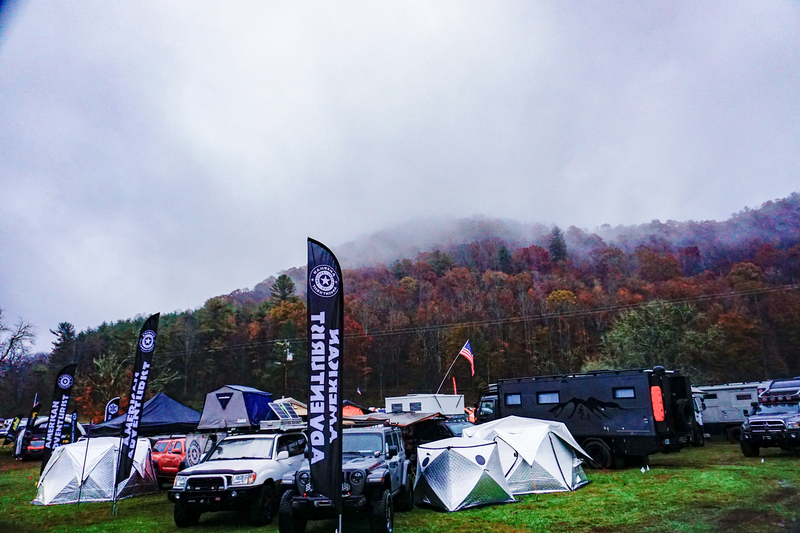 Despite the inclement weather, we felt fortunate to be able to be in North Carolina to share our passion for vehicle based adventure travel with thousands of like-minded folks. Excuse our foggy lens and shaky hands here folks, and enjoy! 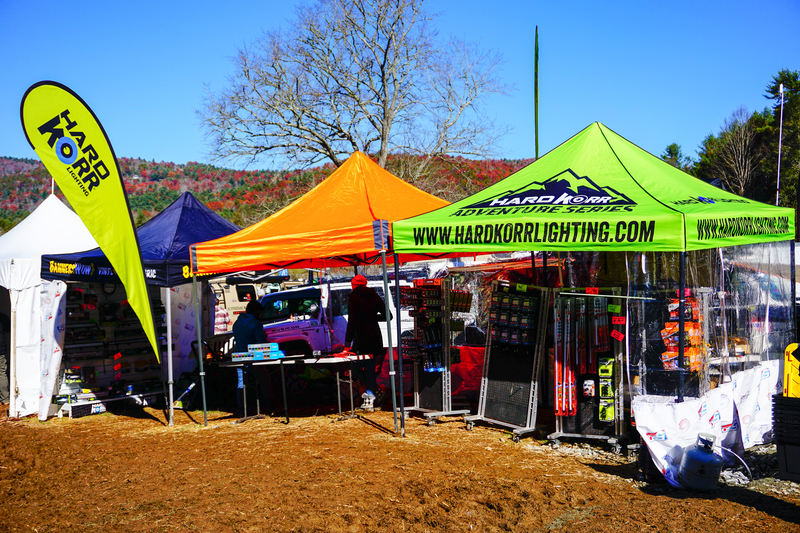 Now let’s get to what you came here for….The gear… The rigs… The vendors… The EXPO! OK 4WD was our neighbor and had one of the biggest vendor sections showing off a nice selection of Alu-Cab products including several models of the Khaya camper and one sweet American Expedition Vehicles RAM 3500 with a tilting bed tray. Genesis Offroad had their new Jeep JL dual battery system on display, a very well thought system with high quality components. A newcomer in the North American awning market is Kinsmen Hardware who teamed up with Blue Ridge Overland Gear. They had their Rapid Deploy 270°awning along with the Rapid Deploy Camp Shower Stall on display, both very well made with Sunbrella marine fabric and powder coated steel and stainless-steel hardware. Fresh from their debut at SEMA, Sloop Imports had their Camp King Industries heavy duty and light pickup truck accessories including their 12 Volt Mate Portable Dual Battery System. EarthCruiser’s new EXD chassis-mount camper for 1-ton trucks was a sweet home on wheels capable of going off the beaten path. A nice plug and play option for HD truck owners. Overland Experts put on a class at the ARB booth on how to replace a valve stem on the trail using their new ARB hydraulic recovery jack. ARB had some seriously nice equipment on display including their new lineup from Old Man Emu. Kenda Tires had their full display of tires for everything from bicycles to motorcycles to 4×4’s. They also had their awesome diesel Suzuki Samurai SJ410. Rhino Rack had their soon to be released and newly redesigned Pioneer Platform and Backbone System for the new JLs. WARN was there showing off their black Epic Sidewinder. I had the opportunity to take the new 2019 Ford Ranger for a spin. We’re looking forward to the competition and innovation that this will bring to the mid-sized truck market. 7P Overland’s Mark Farage was on hand instructing recovery classes. 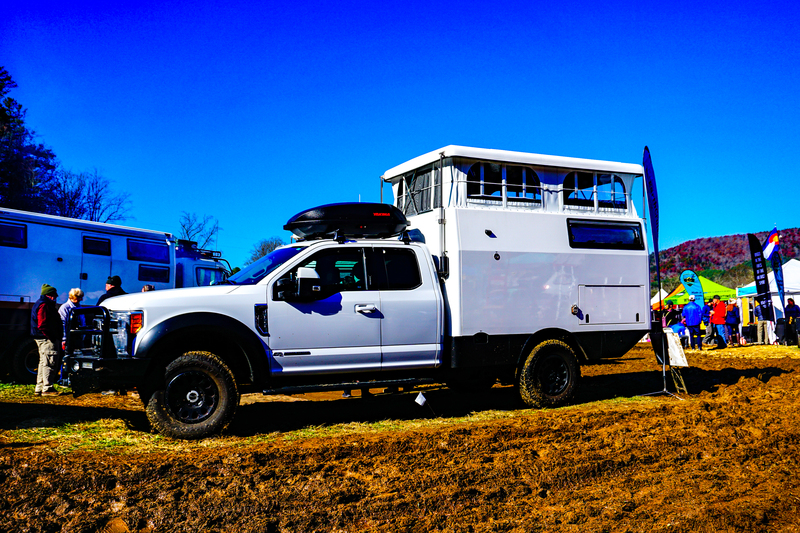 And who doesn’t like a Sprinter Van with 37″ mud-terrains? Or an easily mired Earthroamer? Lots of big tires and big budget builds at Overland Expo. Goose Gear, Engel Coolers, REDARC Electronics, L.T. Wright Knives… and many more. SO MANY VENDORS TO SEE!!! New on the scene here is Hard Korr Lighting. They’ve been making really cool stuff for the Australian market for years and we were super impressed by the sheer size and scope of their product lineup. We’re a bit jaded when it comes to LED lighting, but we have to say their products are extremely innovative and well made. Their UNILIGHT wins our BEST NEW PRODUCT AWARD for the show – we’re not posting a picture of it so follow the link to check it out – these are flippin’ amazing! They’re really nice people too so check them out and tell Marty we sent ya! With this year’s event falling on Veteran’s Day weekend, and the Marine Corps birthday, the American Adventurist crew stood tall to honor our American Veterans. On Saturday night we put out an all hands call for U.S. Marines past and present to proceed to our booth at 1900 for the reading of the annual birthday message from the Commandant of the Marine Corps followed by the traditional cake cutting ceremony. This birthday celebration has been taking place every year for 242 years, in every clime and place, and we made sure that this was a truly a memorable experience for all who attended. Meanwhile, out and about in the main camp areas. You never know what rare and interesting vehicle you’ll find camped out at the show. For me I have just as much fun if not more walking around these many “regular people” camps surrounding Expo. Seeing all of the cool rigs and meeting new folks is a major highlight. Because let’s face it, there are plenty of rigs to drool over, and putting your hands on the hot new products is fun. But the best reason to attend one of the Overland Expos is the people you meet and the stories and knowledge that are shared. Next time you are at one of the Expos stop by our booth, say hi, and share a story. Oh…and don’t forget to ask Dave for your free hug. Tell him I sent you! Great feedback! Thanks for stopping by and for following up here with us - see you at Appalachian Rendezvous! Glad you where able to have a good time and meet some awesome folks! Looking forward to seeing you at Appalachian Rendezvous.